The reactionary remnant of movie hero Clint Eastwood was at it again recently, boasting that if Michael Moore had arrived uninvited at Eastwood’s home, the way that Moore famously did at the home of Charlton Heston, Eastwood would have shot him. Eastwood didn’t talk about having his gun pried from his “cold, dead hands,” but his bravado was clearly part of the misunderstanding of history that underlies much of the mindset — and too much of the rhetoric — of the Tea Party and its sympathizers. 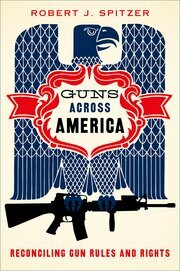 It’s too bad that very few of these uber-patriots will hear of, much less read, a meticulously researched, absolutely persuasive book — Robert J. Spitzer’s Guns across America: Reconciling Gun Rules and Rights (Oxford, May 2015). Hey, you! — Stop fracturing your own spine back there! The reactions to the arrest-related death of Freddie King in Baltimore are as varied as you’d expect. Some of them defy comprehension, while others show careful, clear thought. It’s not easy to excuse arsonists and looters, but it is possible to understand them. You try living with the profound weight of both poverty and racism, day after day, year after year. At best, your outrage overflows when a Freddie King dies, and you join a street protest that you know, deep down, will do little other than give your more violent impulses a non-violent outlet. At worst, you’ve been shortchanged so often and in so many ways that you never experienced the self-respect that would have restrained the mindlessness of the mob you’ve joined. Sometimes, when a scream of outrage isn’t enough, there just isn’t any other way to let the injustice out than an act of rage. I’m not condoning it, mind you, but I do have to try to understand it. The reactions of some of our public actors are no easier to condone, but they are harder to understand. Just a few of them will give us a sense of the range of these outrageous responses. Which view of the “Death Tax Repeal Act of 2015” is really “immoral”? Need more proof that the Republicans in the U. S. Congress are really, really, out of touch with the lives of most Americans? The Huffington Post reports that the House of Representative has voted to repeal the 100-year old estate tax — best viewed as a retro-payment for the government protections, infrastructure, and (in some cases) subsidies that have helped the 0.2% of the population who would ever have to pay the tax to acquire (and in the case of inherited riches, retain) so much wealth in the first place. As Donald Gutstein usefully explained in Harperism, there are several kinds of liberalism, and their differences are crucial to the ways that governments seek to operate. Laizzez-faire” liberals were in favour of expanding personal rights and liberties, but they believed that government should remain “hands off” on the economy. (Adam Smith’s famous “invisible hand.”) In contrast, New Deal liberals saw government as an active shaper of economic opportunity, security, and relative equality. Libertarians distrust government in all but its most basic function, which is simply to keep someone else from messing with their personal wealth and privilege. Then there are the neoliberals, who are often confused with libertarians but who demand that government play an active role in the economy. The neoliberal idea of a perfect government is one that supports and facilitates the free market. Another must-read book is Chris Turner’s The War on Science (the source of this article’s title) which shows with alarming clarity that one of the worst consequences of the radical neoliberalism practiced by Stephen Harper’s Conservatives in Canada is his government’s systematic dismantling of the fact-based science that had long characterized Canada’s public policy. Canadian author Donald Gutstein is a friend of one of the members of our regular Monday morning ideas group, and recently we met with Donald to discuss his important book, Harperism: How Stephen Harper and his think tank colleagues have transformed Canada. Unlike other books on Canada’s most conservative government, Harperism focuses on the political philosophy at the foundation of what to many is an alarming reversal of our country’s traditional role as an advocate of social justice and environmental responsibility. It’s not that Harperism ignores these changes. On the contrary, Gutstein explains them in terms of the “neoliberalism” at their heart. This focus makes Harperism important far beyond Canada’s borders, for neoliberalism underpins the successful imposition of “free market” ideology into the policies of most of the world’s titular democracies.